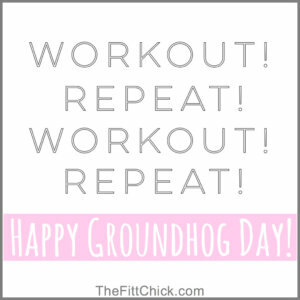 Are Your Workouts Feeling Like Groundhog Day? When you first start working out, everything is new. Every exercise is a challenge. Your muscles are moving in ways they aren’t used to, and your mind is fully focused on recruiting the right muscles, with the right force, to produce proper execution of everything from a squat to a push-up. If you stick with it, you start to notice changes in your strength and, eventually, body shape. It’s exciting to challenge yourself and motivating to get results! So you keep doing the same thing, because it’s working, and it’s fun. Until it doesn’t. And it’s not. Exercise programs are based on progressions. You must continually create a challenge for your body in order for it to change and get better. Whether “getting better” means lifting heavier weight, rowing more reps, or running faster, your workouts need to change to avoid a rut. There’s no one way to lose fat, get stronger or run faster. Play with programs until you find one you truly enjoy, and track your progress so you know where you came from, and can see where you’re going! Do you need a way to mix up your routine? Click HERE for a ton of exercise tips and workouts! Or sign up today for 8 one-hour personal training sessions for just $99 at the F.I.T. Boutique!